The weekly photo challenge vivid imediately bought to mind the bright, intense and cheerful colours of the Cape Town Minstrels. 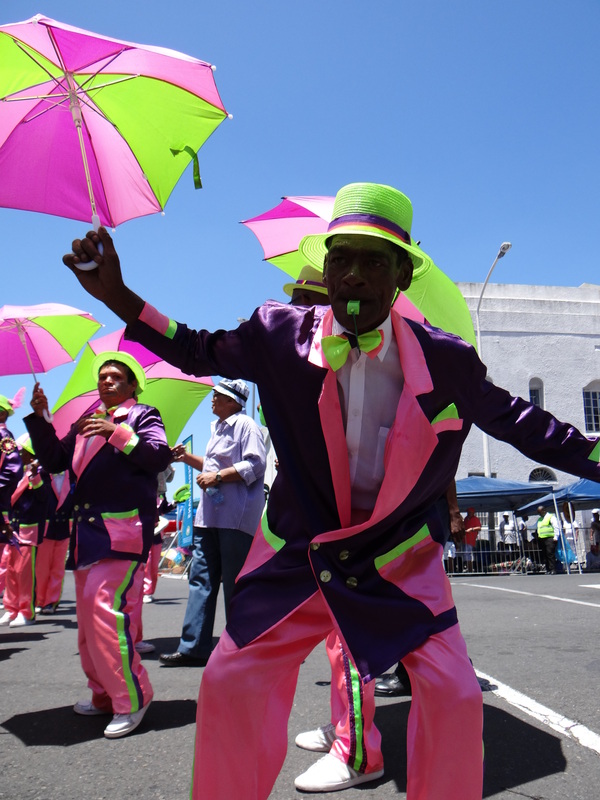 In CAPE TOWN, South Africa you get to watch these colourful and brightly dressed mistrels parade the streets as they celebrate the Tweede Nuwe Jaar event ( Second new years ). The Cape Minstrels (also known as the Kaapse Klopse) take over the streets of the Mother City each year on the Second New Year Street Parade, which takes place on 2 January.These minstrels, all dressed brightly parade the streets, waving parasols, strumming banjos and making merry with music. The whole city was engulfed in their festive mood and it felt like everyone was out and trying to get a glimpse of these cheerful minstrels. They are just as friendly as their costumes are bright and colourful. Love the bright colors they are wearing and their expressions in some of the pics! They are cheerfiul and in lots of thye photos you can see that they are having fun! Wow! Incredibly vivid. Right down to the green whistle. Great photos, Janaline. Thank you. Every year they wear different costumes. Cant wait to see wht they look like next year. Vivid indeed Janaline!! Reminded me of the Mummers Parade in Philadelphia every New Years Day. Great fun for all!! I would love to see that parade Tina, along with the colourful South American celebrations. Hopefully one of these days. utterly brilliant the colours are just awesome! I loved the colours and watching them in action was fabulous. Nice choice for the theme. Thanks for joining in.